We’ve said it before, but we’ll say it again – singer Wilson Pickett was one of the giants of American soul music. The dynamic showman and vocalist scored 17 Top Ten hits on the R&B chart between 1962 and ’72, and charted a whopping 50 songs overall during his career, including such timeless classics as “In The Midnight Hour,” “Land of 1,000 Dances,” “Mustang Sally,” and “Funky Broadway,” among many others. Pickett’s influence on the evolution of blues, soul, and rock ‘n’ roll is inestimable, and he was inducted into the Rock & Roll Hall of Fame in 1991. On August 5th, 2016 Real Gone Music will dip into the wide and deep Wilson Pickett catalog with the release of artist’s The Complete Atlantic Singles, Vol. 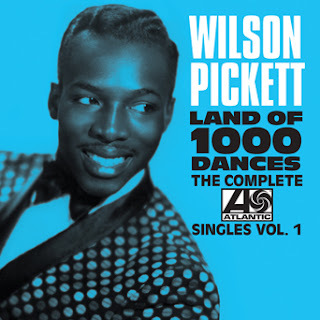 One, a 22-song anthology that features Pickett’s first eleven singles recorded for the legendary Atlantic Records label (A and B-sides both). The tracks were sourced from the original master tapes, re-mastered by Mike Milchner, and are offered here in their original mono mixes that have never been previously released on CD (not even on Rhino Handmade’s Atlantic Records set). Joe Marchese wrote liner notes for the new set, which is the first of three albums of Pickett’s Atlantic singles. Pickett’s The Complete Atlantic Singles, Vol. One includes some of the singer’s biggest hits, including “In The Midnight Hour,” “634-5789 (Soulsville, U.S.A.),” “Land of 1,000 Dances,” “Mustang Sally,” “Don’t Fight It,” and others. The musicianship on these sides is exemplary, featuring talented players like guitarist Steve Cropper, bassist Donald “Duck” Dunn, keyboardist Isaac Hayes, and drummer Al Jackson – the Stax Records house band minus Booker T, really. The results are musical magic. This isn’t the first time that Real Gone has dipped its toe into the Wilson Pickett back catalog, either – late last year the archival label released Pickett’s Mr. Magic Man: The Complete RCA Recordings to no little acclaim. The Pickett legend begun with these Atlantic Records sides, though, so it looks like Real Gone is going to strike gold once again!